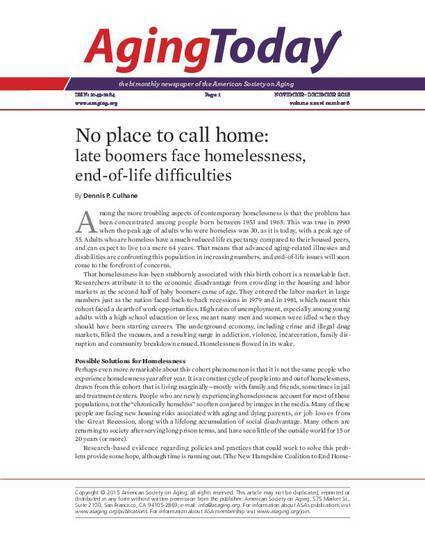 Among the more troubling aspects of contemporary homelessness is that the problem has been concentrated among people born between 1953 and 1965. This was true in 1990 when the peak age of adults who were homeless was 30, as it is today, with a peak age of 55. Adults who are homeless have a much reduced life expectancy compared to their housed peers, and can expect to live to a mere 64 years. That means that advanced aging-related illnesses and disabilities are confronting this population in increasing numbers, and end-of-life issues will soon come to the forefront of concerns.